We are close to winning a huge victory for working Vermonters by raising the state’s minimum wage—providing a nearly $250 million boost to the state’s economy, and lifting thousands of the state’s lowest-wage workers out of poverty. On Friday, the House Appropriations committee voted to send the bill to a full floor vote this week: that House floor debate and vote on this important bill is expected to happen on Tuesday! Join us tonight at our Burlington offices – or from your home – for a statewide phonebank to get this bill passed in the House this week. RSVP on Facebook, or if you can’t make it to our offices email Elise Greaves for other ways you can help make calls. The Vermont Raise the Wage Coalition, which includes Rights & Democracy, has led the effort to pass this bill, as well as Paid Family Leave, during this biennium. Friday’s vote to move the bill to a full floor debate was a huge step forward. In addition, key Senate committees have agreed to move the paid family leave bill to a floor debate in that chamber. Your Representatives needs to hear from you before Tuesday about why they need to support raising the minimum wage. If you have a personal story about the impact low-wage work has had on you, that’s the most powerful story to tell. For some additional key myth-busting talking points, see below. This is great news to hear from the Speaker, but we want to hear this message coming from your Representative too. If they support the legislation – thank them! Here’s two ways to make sure this bill becomes law this year. Call and email your Representative today: You can look up their contact information here. You can also leave a message for them at the Sgt. at Arms office. That number is (802) 828-2228. Call Gov. Phil Scott at (802) 828-3333 and tell him to stand with working Vermonters and raise the wage! 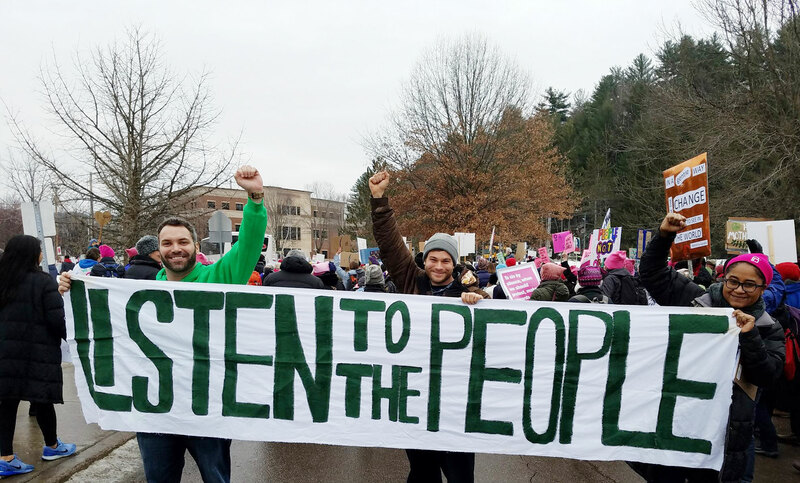 At a time when billions in federal tax breaks are being given the wealthy, raising the standard of living for thousands of Vermonters—many of them women and people of color—is only fair and just. But it will only happen if legislators and Gov. Scott hear loud and clear from folks like you. Here are some key talking points to combat some common myths, if you need them, when you’re talking to or emailing your legislator. Check out this story from New Hampshire, which explains how workers are seeking jobs in Vermont, Maine, and Massachusetts because the minimum wage is higher in those states. As a result, New Hampshire businesses are raising their wages to compete. In other words, raising the minimum wage attracts workers. Opponents like to say jobs could be lost, but this ignores a simple truth: People who make more money don’t need as many jobs to support themselves or their families. So, if someone works two jobs now, they may only need to work 1.5 jobs in the future. But, they have more money in their pocket. A win-win! The wage increases will happen slowly over a six-year period. Businesses, and nonprofits, will have time to adjust. And, it’s not like the cost of living is going to stop going up in those six years. Some large nonprofits—such as the Champlain Valley Office of Economic Opportunity—already pay their employees more than $15 an hour because as an anti-poverty organization, they don’t want to be paying staff poverty wages. The benefits cliff concerns are real, but they’re real for folks today. Someone making $10.50 an hour can lose public benefits for food, housing, and child care. Raising the minimum wage will not exacerbate the problem, but provide people a path off of receiving benefits—which is what many low-wage workers said during two separate public hearings this session.